This is another old post from emerald.bbboy.net/nickdisk. SOme things will be added though. Anything I put in red will be what's new in this fic. Images will also be added. In Dimsdale, USA, probably California, I am with Timmy and his Godparents. It was Saturday Morning after breakfast. Cosmo and Wanda were planning to go to Fairy World and wanted to take me and Timmy too. I don't want to go and neither does Timmy but we go anyway. Now we are in Fairy World. "Yep" I say, "Might as well just enjoy it now that we are in." Suddenly, Jorgen appears and makes Cosmo and Wanda do some training. Where did me and Timmy go? Well Timmy and I went to the Fairy World Military Base where the academy was. There was a PX, a book store, a commisary, and other things like Burger King. THere is also a CLinic. Timmy and I went to the Book Store to read some books. I was looking at train books and Timmy was looking at Crash Nebula Comic Books. Then we decided to have lunch and had Burger King. We had Bacon Double Cheese Burgers, French Fries and Medium Orange Sodas. Then we after that went to the PX. It is neat. When we leave, we see Cosmo and Wanda all angry and upset. THey are not upset with us, but with Jorgen and with each other. I don't know what they did but Cosmo was so upset he returned to Mama Cosma's house. Not again! "I wish William and I were back in the human world" Timmy says. Unfortunetly for Timmy Wanda hasn't enough power to get us back to the human world. Timmy Turner and I are trapped in Fairy World thatnks to Cosmo abandoning us, and Wanda again. Obviously Cosmo is really ticked off at what Jorgen made him do and he took it out on Wanda. What a baby! "Oooooh" I say "This is all Cosmo's fault"
"Actually" says Wanda, "IT's Jorgen's fault. And we did not even have to train and he made us. And Cosmo said he did not want to be a Godparent any more." "Well he can't stop being a Fairy" says Timmy. "Yeah that's for sure" I say. Meanwhile at Mama Cosma's house Cosmo once again returned to his mother. But who did he find but Cupid from the Fairy Dating Game. I wonder if that will be in this Fan Fic later on. When Cosmo sees his mother, she says to him, "Oh it's you Cosmo. THe fairy that ran back to that Wanda Girl." "Well mama" I am back and this time I am sure to not go back with her or anyone else ever again. I want to be with you and only you." "Are you sure" says Mama Cosma, "Because this time I am more powerful than ever and this time you won;t escape or go back to that Wanda girl." "That's fine with me" says Cosmo, "I never want to see her again or any one else even if it is SIlly Pink Hatted Timmy." "Oh by the way" says Mama Cosma, "Meet your new Father Cupid." Cosmo is surprised at what he sees and heard. "You married Cupid?" Cosmo asks. "Well he kept chasing me around" says Mama Cosma, "I gave up and decided to marry him"
"Let me start dinner" says Mama Cosma, "We're having Pork Chops and Macaroni and Cheese." "Cool," says Cosmo "I'm starving"
"Come on Wanda there has to be a way to get Cosmo back to us so we can go back to where we belong" says Timmy "besides some of us have school Monday and I am supposed to be playing with Chester and AJ today." So in the human world, Chester and AJ are at the Turner Residents. They see that Timmy is not home and is no where to be seen. They give up and leave. THey run into Elmer the kid with the Boyle on his cheek. "Timmy stood us up!" exclaims Chester. "That fiend!" says AJ, "We planned to hang out together he leaves without even telling us!" "Alright lets go" says Chester. "Yeah since Timmy is not around, lets play with the dufus." says AJ. THen Trixie, Tad and Chad, and Veronica all laugh at Chester, AJ and Elmer. "If Timmy was here" says Chester, "this would'nt be occuring and Timmy would be running over to them." "Besides Timmy", I say, "YOu don't go to school this week, it is a Spring Hoilday. So you are okay." "Let's find a place to eat and then check into a hotel for the night so we can rest. We'll go to Mama Cosma's house tomorrow." "I hope so" I say. "I love Fairy World but I don't want to spend the rest of my life in it." "We all go to Etsa Pizza's all you can eat Pizza Buffet. I ate 10 slices of Pizza, and then I was full. TImmy ate eight slices, and Wanda, well who cares." THen we all go out and find a hotel to stay in. This hotel is called Fairy Inn. IN Mama Cosma's house, Mama Cosma, Cosmo, and Cupid are eating their Pork CHops and Macaroni. Cosmo is still over Wanda and Timmy and I. They are eating dinner and there are candles on the table. THe next day we get up and find Mama Cosma's house. WHile Mama Cosma, Cosmo and Cupid are having Mama Cosma's home made Waffles and Bacon, we break in. Wanda goes, "Alright Cosmo, stop what you are doing and get out here!" "Ooooh isn't that Waffles, I love Waffles" I say. "William!" Timmy and Wanda yell looking at me. "Oh yeah sorry" I say. Mama Cosma appears to us saying "Unless you are here to have my home-made Waffles, GET OUT You're not welcome here, and besides Cosmo is over you. Bye Bye!" THen Mama Cosma makes her Wand glow and makes us all go away. We almost ruined breakfast. "I can't believe Mama Cosma made us leave so quickly" Timmy says. "You know I just can not believe how good those Waffle's smelled, I say in my own world, "Oh yeah mmmmmmm!" Then Timmy comes and slaps my face "William you're in La la land again. Forget those stupid Waffles and think of a way to get Cosmo back to us so we can leave. We can't stay in Fairy World forever!" "Calm down Timmy" I say, "Besides, I feel bad about bucking in during their breakfast." "Wanda I wish he was out of his own world and paying attention to what is really going on" Timmy says pointing at me. Then Wanda bops her wand on my head and it hurts that tears go out of my eyes. THen I am focused. "Alright alright," I say, "We need to find a way to get Cosmo back to us before we have to stay in Fairy World forever. Maybe Jorgen can get us back to the real world." "And if he does that" Wanda goes "How else is Cosmo supposed to get back to us?" "You know what" says Wanda, "Just shut up! Since you don't have any good ideas, just be quiet." Hearing that felt like being with an adult and another child. Like my mother and my sister, or other adults and children. We kept going back to Mama Cosma's house and kept getting thrown back out. It took almost a week to get back to Cosmo to get back to us. Finally This time we go back to Mama Cosma's house, Cosmo and Wanda start fighting. They also argue. Here we go again. Timmy and I sit and watch. Cosmo and Wanda are turning each other into things. At least Cosmo or his he Mama's boy, is not turned into a baby numner 2ing in his diapers. Timmy and I have to think fast. "Hey I know" Timmy says " I wish you guys would stop fighting!" So Cosmo and Wanda stop fighting each other. "Look you guys", I say to Cosmo and Wanda, "This is silly! I hate to see people, not to mention fairies fighting. It's just not a sight I like to see." "And besides, Cosmo," I say, "You were acting very immature. It was one thing to be mad a Jorgen, heck I was too, but you got unbelievabley upset for no reason and you really flew off the handle. You should have been a whole lot calmer and we could have been back home by now. Finally Cosmo realizes he's been a total jerk and apoligizes and he goes back to Wanda. 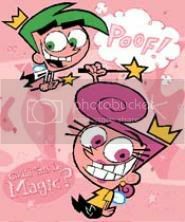 Mama Cosma tries to stop it but I go over to her and say, "Hey Little Miss Greenett, leave Cosmo and Wanda alone, don't you know Timmy Turner and I have been stuck in Fairy World for almost a week and we really need to go back. I am sure his parents are very worried and we really need to go back. So please spare Cosmo this time and let him go. If you don't, than we are stuck in Fairy World and need to leave right away!" Mama Cosma thinks for one moment and then decides to let Cosmo have one more chance, and if he returns to Mama Cosma's, he'll be there forever, so that means we can not go back to Fairy World if this happens again, unless Wanda finds somebody else to be with. So Cosmo and Wanda are finally back together. Now Timmy and I can go back to the Human World. "Alright Cosmo and Wanda" Timmy says, "Now that you're back to normal, I wish we were all back on earth right now." SO Cosmo and Wanda raise their wands and we all teleport back to the Turner Residents. Phew, that was very tiring. Mr. and Mrs. Turner come to Timmy's room. Cosmo and Wanda become goldfish and get into the fish bowl. Mrs. TUrner "Timmy, you're back, we missed you." She was crying as if she was never going to see him again. Mr. Turner goes, "I was very worried. Where on earth did you go?" "I'll fill that question" I say, "We went out of town, and boy did we have a good time." "We called the police and the hospitals wondering if they'd seen you Timmy. "Well it's my fault Ms. Turner" I say "I shouldve told you before we left. So I am totally sorry." "Apology accepted" Mr and Ms. Turner say, "Just becareful next time and let us know what you are doing next time you go somewhere." "Let's find Chester and AJ" TImmy says. "SO we (Me and Timmy) go to see Chester and AJ"
We go and see them with Elmer. "Do you hear something AJ?" asls Chester. "The only thing I hear," says AJ "Is a voice of somebody who stood us up!" "Guy's Timmy said," I'm sorry, "I was trying to come to you guys but I..."
"Because of you," exclaims AJ, "We were forced to hang out with Elmer here, and Trixie, Veronica, Tad and Chad made fun of us!" "Guy's", Timmy says, "I'm really sorry!" "Yeah guys," I say, "Don't be angry with him, it's my fault he wasn't with you guys. I took him somewhere and he tried to tell me he had to come see you but I got carried away, so blame everything on me and forgive Timmy." Chester and AJ think about this. "Okay," says Chester, "You're forgiven." "Next time," says AJ, "If you're not going to be with us, please let us know in advance so that we'll know to change our plans." So finally, Timmy, CHester and AJ make up, reunite and play together again. "Well," says Elmer, "I guess I have to go now." "Wait," says Timmy, "You can stay with us." "Remember," says Timmy, "You're one of us now. Besides you're the back-up me remember?" "So please," Timmy says, "Stay and hang out with us!" How Many Slices of Pizza can Timmy really eat? By the way, stay tuned for "Deleted Scenes"
This is what was in the old story but these were some things I chose to leave out. The left out parts will be in green. "Hey I know" Timmy says " I wish you guys would stop fighting and would go to the Fairy Dating Game. Cosmo and Wanda stop fighting and Cupid, Mama Cosma, Cosmo, Wanda, Timmy, and I are in the Fairy Dating Studio. At least those robots are not there. Timmy is also not a toilet. We learn that Cosmo was mad at us for no reason and was mainly upset with Jorgen. Finally Cosmo apoligizes and he goes back to Wanda. Mama Cosma tries to stop it but I go over to her and say, "Hey Little Miss Greenett, leave Cosmo and Wanda alone, don't you know Timmy Turner and I have been stuck in Fairy World for almost a week and we really need to go back. I am sure his parents are very worried and we really need to go back. So please spare Cosmo this time and let him go. If you don't, than we are stuck in Fairy World and need to leave right away!" So Mama Cosma and Cupid go back home and Cosmo and Wanda are back together. So now Timmy and I can go back to the Human World. "Alright Cosmo and Wanda" Timmy says, "Now that you're back to normal, I wish we were all back on earth right now." SO Cosmo and Wanda raise their wands and we all telleport back to the Turner Residents. Phew, that was very tiring. Mr. and Mrs. Turner come to Timmy's room. Cosmo and Wanda become goldfish and get into the fish bowl. We go and see them with Elmer. THey even tell us that Trixie was there and so were the popular kids. You seem to be the only person who replies me. Oh well, I guess it's better than not getting any replies at all huh? A good book may be anarchy credits sell among the best of friends. It is the same today that it always was, and it will sell rift plat never change. It always receives us with the same kindness; amusing and instructing us in youth, and comforting sell rift gold and consoling us in age. Labor vanquishes all---not inconstant , spasmodic, or ill-directed labor; but sell rift gold faithful, unremitting, daily effort toward sell rift plat a well-directed purpose. Just as truly as eternal vigilance is sell rift gold the price of liberty, so is eternal industry the price of noble and enduring success.